May aid in high blood pressure control, congestive heart failure care, and improved athletic performance in some individuals. 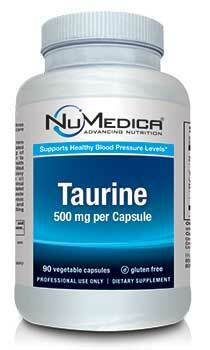 NuMedica Taurine is a free-form taurine supplement, which is an essential amino acid. Taurine is not used in protein synthesis, however it is found in most of the tissues of the body including in the nervous system. This supplement works to stabilize cell membranes and helps to move other nutrients including sodium, calcium, potassium, and magnesium into and out of the cells based on the need. This supplement also works to generate and then regulate nerve impulses while also balancing fluid in the body. In addition to these functions, NuMedica Taurine can aid in other functions of the body including the visual pathways, brain, and nervous system. This product contains 500 mg tablets. NuMedica is a leading supplier of high quality natural supplements and industry leading products designed to enhance health and wellness. Often considered the benchmark for quality and effectiveness in natural products, NuMedica offers advanced nutritional support to enhance well being. In addition, this product works with glycine and GABA as a neurotransmitter. 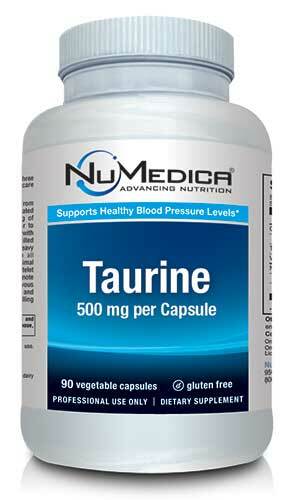 Taurine is a fundamental component of the body. This amino acid supports neurological development and aids in the regulation of all water and minerals throughout the body. It can also have high antioxidant benefits in many people. It is naturally found in fish, breast milk, and meats, but is often supplemented in people who do not receive enough from their diet. As a conditional amino acid, taurine is a natural chemical that is a building block of protein. High levels of this nutrient are present in the brain, heart, and blood cells. Taking taurine can be beneficial for many people including those who are supplementing other medications that treat congestive heart failure, high blood pressure, cystic fibrosis, and cholesterol. In these instances, taurine may work to help improve heart failure because it works to lower blood pressure and calms the sympathetic nervous system. This system is a key component of the body that addresses high stress levels. Taking this product may also help with hepatitis, or liver disease, by improving liver function in individuals with this condition. Directions: Take one capsule up to three times daily with meals or as directed by your healthcare practitioner. Not manufactured with: Wheat, gluten, soy, milk, egg, fish, shellfish or tree nut ingredients.